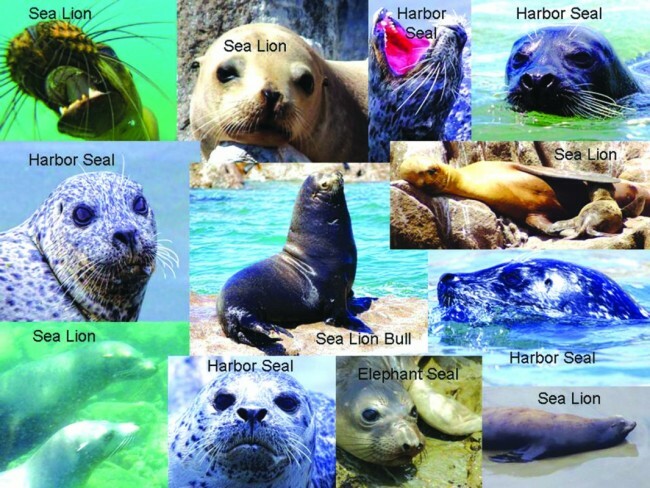 Home » Steve Franklin » Am I a Sea Lion or a Seal? Am I a Sea Lion or a Seal? Have you ever wondered about the main differences between sea lions and their second cousins, seals? First, Sea Lions can stand up on their front fore flippers and seals cannot. Both seals and sea lions, together with the walrus, are pinnipeds, which means “fin footed” in Latin. But seals’ furry, generally stubby front feet, thinly webbed flippers with a claw on each small toe, seem petite in comparison to the mostly skin-covered, elongated fore flippers that sea lions possess. Secondly, sea lions have small flaps for outer ears. The “earless” or “true” seals lack external ears altogether. You have to get very close to see the tiny holes on the sides of a seal’s sleek head. Third, sea lions are noisy. Seals are quieter, vocalizing with soft grunts instead of loud barking or roaring that sea lions got their name from. Fourth, while both species spend time both in and out of the water, seals are better adapted to live in the water than on land. Though their bodies can appear chubby, seals are generally smaller and more aqua dynamic than sea lions. At the same time, their hind flippers angle backward and don’t rotate. This makes them fast in the water but basic belly crawlers on land. Sea lions, on the other hand, are able to “walk” on land by rotating their hind flippers forward and underneath their big bodies. This is why they are more likely to be employed in marine type shows. Fifth, Seals have various colors with most often shading or spotting on their fur. Sea Lions are generally only one basic solid color, usually brown. Finally, seals are less social than their sea-lion cousins. They spend more time in the water than sea lions do and often lead solitary lives in the wild, coming ashore together only once a year to meet and mate. Sea lions congregate in gregarious groups called herds or rafts that can reach upwards of 1,500 individuals. It’s common for scores of them to haul out together and loll about in the sand, comprising an amorphous pile in the noonday sun. 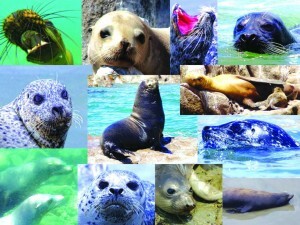 Oh…and by the way…There are no seals near Rocky Point, only Sea Lions. Can you name the Seal or the Sea Lion in the picture?